Spring is round the corner. The days are getting warmer and people are starting to think of their summer holidays. Want a productive summer break on an enchanting island? 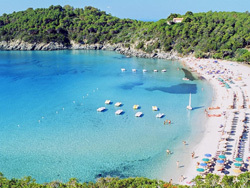 Then take an Italian language course in amazing Elba! For those of you who are not familiar, Elba is a Mediterranean island in Tuscany, Italy. Elba is located in the Tyrrhenian Sea, about 50 kilometres east of the French Island of Corsica. It’s the third largest island in Italy, after Sicily and Sardinia and the largest island in the Tuscan Archipelago.